Celebrating 50 years of SHIELD, Marvel’s premier spy organization, they have released a series of one shot specials. The two before this were about Quake (Daisy/Skye on the Agents of SHIELD tv show), and Mockingbird/Barbara Morse. This one features Peggy Carter. Like most of the SHIELD-related comics over the last year or so, this tries to straddle the line between fitting the comics continuity but also not contradicting the Marvel Cinematic Universe. There’s an old saying about if you chase rabbits, you will catch neither. 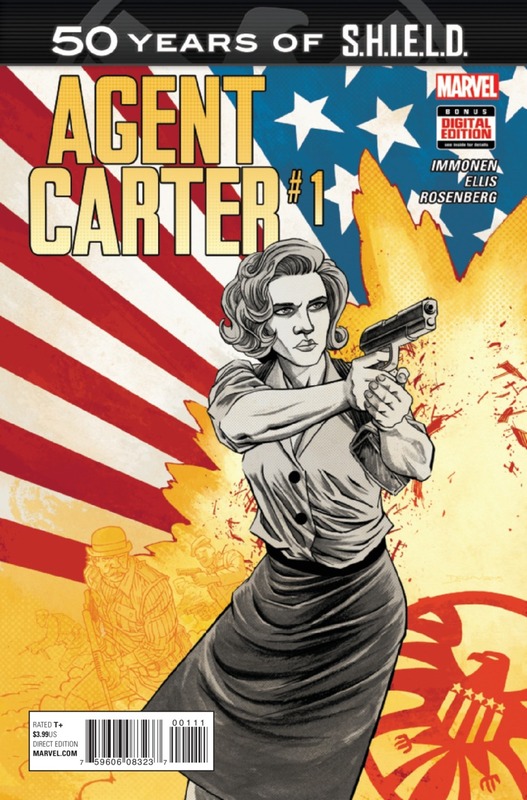 This issue shows us Agent Carter, Dum Dum Dugan, Nick Fury (the original one, not the Samuel L Jackson version), and a surprise Asgardian guest star. The first little continuity glitch seem to be that Peggy knows about Asgardians in 1966, which is certainly well before they popped up in the Cinematic Universe. The issue features a lot of fighting, running, explosions, and a hidden test for Carter. The ending is entertaining, featuring Carter and her new friend flying off into the sunset in one of Fury’s flying cars, Carter wearing her signature red hat from the tv show. Plot: I’ll give this a straight 3 out of 5. It wasn’t bad, and the pairing of Carter and the Asgardian was entertaining. Fury’s Machiavellian plot was about right for the spy-master’s paranoia. Art: The art didn’t quite grab me. It was ok, but nothing really special. I’ll give it a 2.5 out of 5. Positives: Carter is entertaining. I like her on the show, and her characterization here is good. Her temporary partner was amusing as well. Negatives: The tv show and the comics aren’t the same thing. They don’t blend perfectly. They need to stop pretending that they do. It was a fun little story. It’s a one shot worth getting.